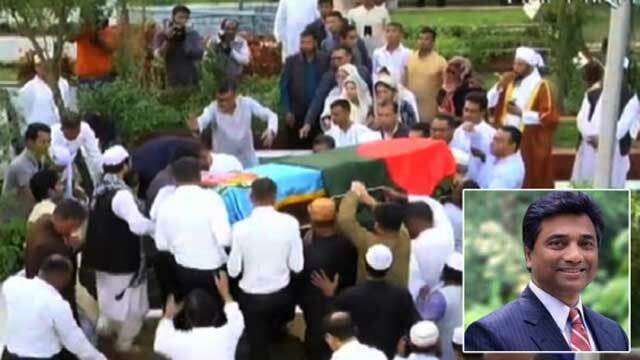 Dhaka, Dec 2 (Just News) : Dhaka North City Corporation (DNCC) Mayor Annisul Huq, who passed away at a London hospital on Thursday while undergoing treatment, was laid to eternal rest here on Saturday afternoon. He was buried at Banani Graveyard at 5:15pm following a namaz-e-janaja at Bangladesh Army Stadium after Asr prayers. Earlier, the nation paid its last respects to the late DNCC Mayor at the Army Stadium after his body was taken to the stadium from his Banani residence around 3:15pm. President’s Military Secretary Maj Gen Md Sarwar Hossain first placed a wreath at the coffin of Annisul Huq on behalf of President Abdul Hamid while Prime Minister’s Military Secretary Major Gen Mia Md Jainul Abedin showed respects to him on behalf of Prime Minister Sheikh Hasina placing another wreath at the coffin. Sergeant of Arms Captain Mostak Ahmed placed a wreath on behalf of Speaker Dr Shirin Sharmin Chaudhury while Leader of the Opposition in Parliament Raushon Ershad also paid her respects to him. Awami League General Secretary Obaidul Quader, flanked by Agriculture Minister Begum Matia Chowdhury, Presidium member Faruk Khan and Joint Secretary General Mahbubul-Alam Hanif, placed a wreath on behalf of the ruling party. Dhaka South City Corporation Mayor Sayeed Khokon and BGMEA President Siddiqur Rahman placed wreaths at the coffin. Besides, Navidul Huq, son of Annisul Huq, paid tributes to the mayor on behalf of their family members. He said his father was always very cheerful person. Love and respect were the most important things to him. Navidul Huq also said his father always thought of the betterment of the city dwellers. He urged the countrymen to pray for his father for eternal peace. Later, people from all strata of life paid their last respects to the mayor. His first janaza was held at Regent Park Mosque in London after Juma prayers on Friday. Earlier, a flight of Biman Bangladesh Airlines carrying the mortal remains of Annisul landed at Hazrat Shahjalal International Airport here around 12:45pm. Annisul’s younger brother and Chief of Army Staff General Abu Belal Muhammad Shafiul Huq received the body at the airport. From the airport, the body was taken straight to his Banani residence. Annisul, also a successful businessman and popular television programme host, breathed his last at the Wellington Hospital in London on Thursday at the age of 66. He was diagnosed with cerebral vasculitis after he was admitted to the hospital on August 13. Later, he was given treatment at the intensive care unit of the hospital for long. Annisul flew to London in the last week of July on a personal tour. Meanwhile, Prime Minister Sheikh Hasina visited the residence of Annisul Huq to console his family members. She went to the residence around 2:45pm and stayed there for some time. Sheikh Hasina consoled the family members and prayed for eternal peace of the departed soul. Born on October 27 in 1952, Annisul completed his Bachelor degree from Rajshahi University and Masters in Economics from Chittagong University. Annisul was elected DNCC mayor on Awami League ticket in April 2015. He had vowed to build a green and clean city and started working to this end. He served as the President of Bangladesh Garment Manufacturers and Exporters Association (BGMEA) for two consecutive terms in 2005 and 2006. Annisul served as the President of the Federation of the Bangladesh Chamber of Commerce and Industry, the apex trade body of the country, from 2008 to 2010 and was the founding president of Bangladesh Independent Power Producers’ Association (BIPPA) from June 1 to November 30, 2015. He is the former president of Saarc Chamber of Commerce and Industry. Annisul established his own business entity in 1986 and was the chairperson of nine export-oriented organisations under the trade name of ‘Mohammadi Group’. Annisul hosted many interviews with politically significant personalities, including one with the current Prime Minister live on national television. He hosted interviews that influenced national elections in forming government. He hosted high-level business discussion programmes on television in which he interviewed both political and business personalities, including finance and commerce ministers.